We are less than a week away from spring and we are eager to start digging in the garden! That means we have loads of fun new things to make your garden more beautiful. Here are 5 garden gadgets you didn’t know you needed. 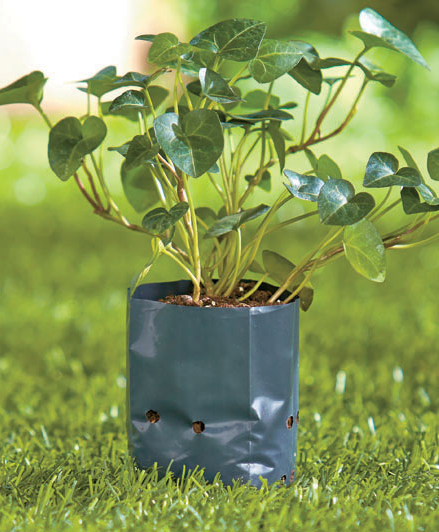 Grow a vertical garden on a wall, fence or balcony with this Pocket Planter! 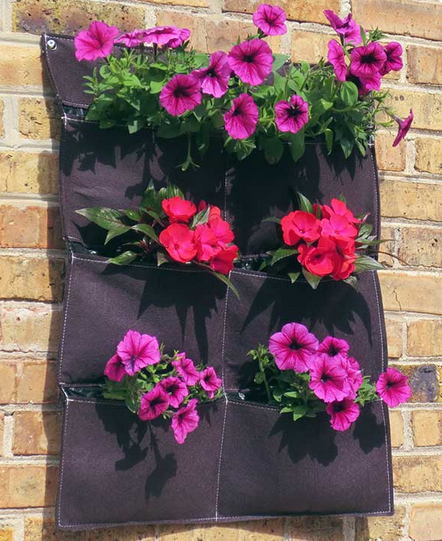 The 6-pocket hanging planter provides the perfect base for a stunning outdoor display. No assembly or back-breaking work needed. Two metal grommets on the sewn-in hanging strip allow you to attach it to masonry, wood, metal or drywall. Simply fill the pockets with soil, add seeds or seedlings, water and enjoy. Durable and weather resistant. 22″W x 27″L. Plastic. Grow your own garden-fresh veggies with this Mobile Vegetable Patch. This mobile, self-watering planter with trellis makes home growing easy. 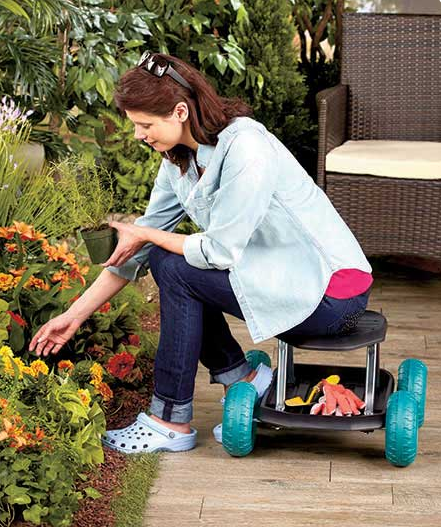 Two wheels and a handle allow you to find the perfect sunny patch in your yard. It holds up to 10 gallons of potting soil and includes an extra-large 3-gallon water storage zone with a self-watering pot. Sectional trellis panels can be added as plants grow, and it will support growth up to 3 feet high. 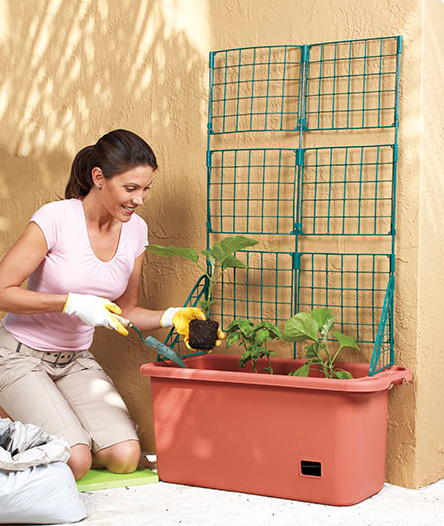 Durable polypropylene planter measures 51″ x 29-1/4″ x 13-5/8″ with trellis attached. With Gardeners’ Grow Bags, you don’t have to dig to have a beautiful, healthy garden. Their durable, compact design is ideal for balconies, patios, decks, apartments and condos, and they fold for storage. Drainage holes allow excess water to escape. An incredible value, the Set of 100 Grow Bags (2-1/4″W x 2-1/2″D x 5-1/8″H, each) features fluted sides that stand upright when filled. Use them for bedding plants, tree seedlings, veggies and more. The Potato Planter (14″ dia. x 18″H) is designed to grow your own fresh produce. Simply fill the bag with soil and add 3-5 seed potato plants. When the potatoes are ready to harvest, pull the flap down in the front and pick your own homegrown potatoes. The bag has carry handles, so you can move it even when it’s full. Polyethylene. Sit comfortably while tending to your garden on a Garden Scooter. Wheels allow you to easily move it from one area of your yard to another. Store your tools below the seat for quick access. 18-1/2″W x 19-1/4″D x 12-3/4″H. Weight capacity, 300 lbs. Plastic and steel. Some assembly required; assembly hardware included. 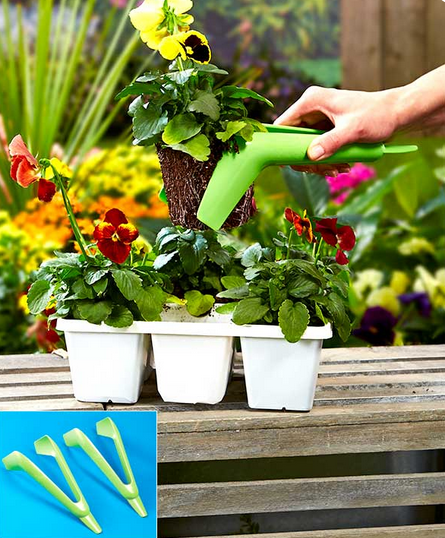 Make planting quick and easy with a Set of 2 Plantongs Hand Tools. This innovative garden tool is actually 2 tools in 1. One end is a spade for digging the hole and preparing the soil for a bedding plant. On the other end are tongs, specially designed for removing the plant from most standard plastic trays and dropping it into the hole. It reduces transplant shock by not damaging the plant or the root ball. 3-3/4″W x 3-1/2″D x 10-1/2″H, each. Plastic.